Personalised Necklaces, it goes without saying that every girl, whether a friend, wife, sister, girlfriend, or daughter, loves to be treated, but nothing pleases us girls more than a gift which has a warm personal touch. For years jewellery has always had a way to find the door to a girl’s heart, and a personalised necklace with a lot of thought behind it is always a good idea and is sure to not only make her day, but her year and more. A life long treasure. What about a thoughtful personalised necklace that makes her think of you every time she wears it? Not sure what style she likes the most? If you are super stuck, a sure bet is a pendent with her initial. You can’t go wrong with our personalised Initial Necklace, hand engraved with a scrolled initial of your choice. Make it that extra bit special with a sparkly gemstone to make her feel as special as she is to you. Choose from any of the birthstones or you can opt for the classic diamond. 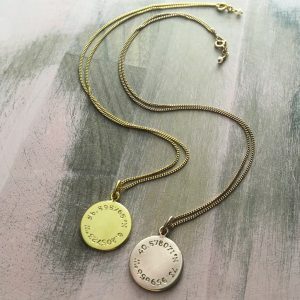 If you don’t want the world to know what the personalised necklace has to convey, our Latitude and Longitude coordinate personalised necklaces are a unique way of marking a special place in you and your girls’ life. A secret set of co-ordinates just between the two of you. Choose from latitude and longitude or GPS style co-ordinates. This will make her feel loved like nothing else. Are you feeling bold? Create two personalised necklaces, one for each of you! Like a promise ring but in necklace form. Show your commitment and love to her, whilst showing her that you want to keep her close to your heart too. A deeply romantic gesture that is sure to win her heart! Personalised Necklaces by Bianca Jones Jewellery. Something personal, so she knows its all hers. Thank you very much for your lovely card for my birthday. and the jewels are absolutely lovely! I couldn’t resist and I’m already wearing the ‘Infinity’ Necklace and Bracelet. I love it!! Thank you so much for having send my order to Switzerland. I really appreciate it.